Just in time for Valentine’s Day, Curtis Kulig gives some much-needed love to this corner wall. It’s bright red and bleeding with heart (See what I did there?). Kulig’s iconic “love me” is often borrowed and if imitation is indeed the highest form of flattery, then places like Lauren Conrad and Victoria Secret owe a lot to Kulig’s imagination. Who: Kulig is a New York based artist but spent some time out in Los Angeles and is always sure to give the City of Angels his love. Kulig originally hails from North Dakota. GQ calls him “arguably the coolest person ever from North Dakota.” He’s a brilliant photographer who specializes in raw black and white footage. That’s why his Love Me campaign is so much fun. 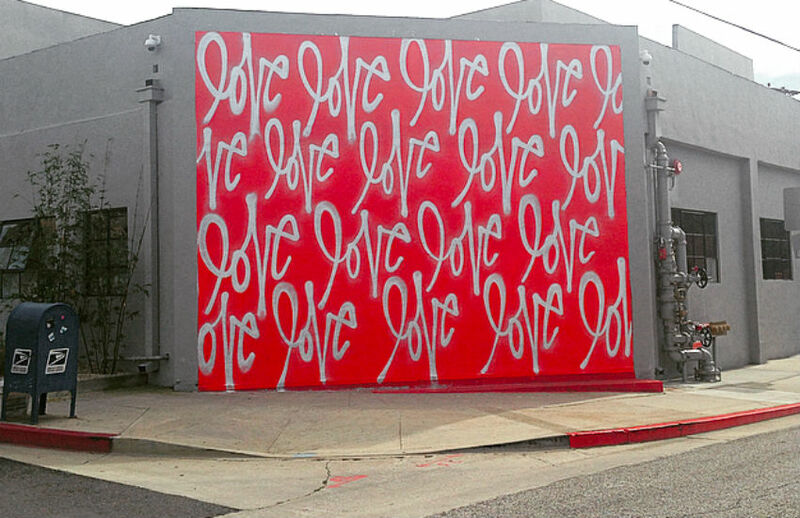 It involves painting the town (quite literally) with love. It’s completely different from his other art, but equally powerful in its simplicity. What: If you’re looking for the perfect backdrop for a romantic proposal, or just a really rad Instagram picture (no filters necessary), head to Culver City this February 14.